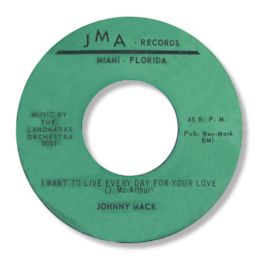 John McArthur was one of the mainstays of South Florida music for over twenty years, making some very fine discs, and yet because of the bewildering array of names he used he has never really received the attention his talents deserved. He started off in the music business as a member of the Majestics whose “Nitey Nite” is a rightly highly regarded by doo wop freaks. 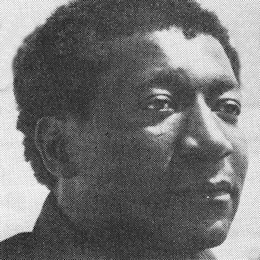 He wrote the song and also wrote the driving blues “A Fool No More” for Marlin stablemate Eddie Hope. His first solo release was the jazzy “Bad Business Baby” recorded with the Marlowe Morris Quintet. Another one-off this time for Bill Lowery’s famous Na-R-Co concern in Atlanta followed a couple of years later. 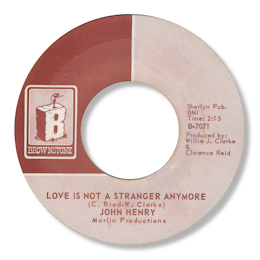 Both sides of this 45 are solid uptempo tunes with McArthur sounding much more comfortable with this sort of R & B based material. He then recorded a dramatic and very soulful version of Sonny Thompson’s immortal Let Them Talk which really showed off his fiery gospel vocals. The flip “I Want To Live Every Day For Your Love” is a very fine piece of strutting southern soul. 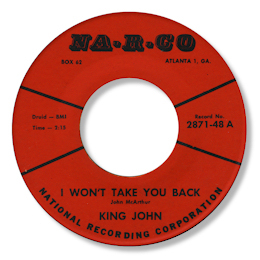 McArthur released these cuts on his own JMA label, before they were picked up by Swamp Dogg and released on Lonnie with a slightly altered title and yet another name change for the singer. Into the 70s McArthur recorded a couple of excellent songs that are rather better known as J P Robinson cuts. He used the same rhythm tracks and it is a tribute to his sizzling performances on the brilliant Love Is Not A Stranger and “Say It” that he certainly isn’t eclipsed by the more celebrated artist. His version of Who Am I is also extremely good and might even be the best thing he ever recorded. The song was first cut by the Famous Flames on King 6431 a couple of years previously but I must say that even though I love that cut a lot the Rootman does it for me. McArthur’s final three 45s were all funk aimed at the audience that were digging all those Florida dance cuts of the time. “Contact” used a neat football analogy in the lyric, but the pick of them for me is the insistent “When You Gonna Give Me That Thang”. But none of them really sold well sadly. John McArthur spent much of his time as a teacher at Horace Mann school in Miami and it was there that he suffered a massive heart attack and died on May 31 1995. A sad loss to his family and the music world. Thanks to southernsoul list members "Evens1" and Jeff Lemlich for extra info.